-Post my stats for 6max here. -Withdrawal my funds from FullTilt and make the switch back to PokerStars. I wanted to set some modest goals that I could actually complete. Soooo here's to the best month everrrr!!!!!!!!! My two goals for the month - plan the play of the hand through all streets before betting the flop; re-read The Psychology of Poker. Only play when i feel im in good mental shape. Buy and read a new poker book. Watch some training vids and post some hands. And obvs. hopefully profit . At 25nl, any idea what range Villain has if he's 150bb's deep and open raises 8x o 12x bb? Pretty sure I need to find a game and just stick with it. I started out playing 2NL, worked up to 25NL, got bored. Then I started playing .25/.50 Limit, worked up to 1/2 limit. Got bored with that. Started playing MTT's and didn't run to well so the bankroll took a hit. So now I'm back to playing 10NL with 37 Buy ins. Any other details? Position, stats, does everyone else have 150bb's as well? yeah that's my little goals..
No real specifics, it was just weird, saw this on several tables from different 150 - 250 bb deepstacks. They all had high vpip's over small samples, but I expect that from deepstacks over small samples. If I remember right, nobody else at these tables were deep. so, after a week of some nice finishes in some micro-buy-in mtts, I find I'm rolled for 25NL, and can take shots at 50NL. I would like to continue moving up the levels, playing mtts when I have the time, and ring when I havent got much time. My question is, what stake should I move up to from 5NL? What level is 5NL similiar to? Just move to the next level. Play nl$10 for a few thousand hands at least. thanks TB, yeah, spoke to a few people, this seems to be the general consensus,Im in no hurry to go directly to 50NL, guess I'll just continue to learn at 10NL, and still play mainly mtts. Last month was my best and worst at the same time. Made $200 in bonuses, but only $30 in actual playing profits. I guess my goals for October are to figure out how to win consistently at 10nl on Stars, and to use my Take 2 promo bonus from FT and apply the Kelly Criterion formula to more quickly grow my bankroll there. No volume goals this month. I think my goal's just going to be crush poker for the whole month. Let's see how that works out. My goal is just to make $100.00.. very low, but I mostly play freerolls with 2700 people and $1 + 0.20 SNGs (ex $1+.25). On October 1st I got $25.00 for playing in September; since I lost all my cash in a second half of Septemeber I wasn't able to play ring games anymore and make $50.00. Today is October 4th and after a few SNGs and HUs my FT bankroll is $45.05. Nice Lem, keep it up!!! -to win a satty and actually use it. I've won quite a few and always cashed them to build br. -to put some kinda volume in at ring, not sure how much though yet! -to watch some strategy videos and take it in. There, not to much to do! I've set a few goals for myself for this month. 1. Consistently perform well at .25/.50 limit Stud Hi, then work my way to .50/1. I don't like to set volume goals, as my time can be limited and rushing hands is bad for me. 2. Get my bankroll on FT to $100. I was close after Take 2, but lost quite a bit playing over my head at NLHU. Playing a solid limit game should get me there with less variance. 3. Play in a few MTTs and perform well. I haven't played these nearly enough, and I know I can do well. I will keep the buy-ins at no more than $5 or 6 depending on the structure. Good luck to everyone else at their goals. Well i have a few goals for the month of Oct. I recently been playing PLO mainly. Nice change of pace and play from holdem. Here is my poker stats for PLO from the last 2 days. I was wondering what are some good stats for PLO 6 max. I am not really sure what i should be trying to shot for to be honest and would luv some help thanks. Also if anyone know any good articles on PLO if u could point me in the right direction that would be helpful also thanks. KD, I'd recommend skipping the HOC books. There is very little of value for a micro/small stakes player in them. Would recommend NL Hold'em Theory and Practice or Professional No-Limit (basically anything by Ed Miller). cheers WV, will look out for them books next time im at the bookshop. harrington taught me a lot about poker, guess it's not that relevant to micro stakes, but a lot of the concepts need refreshing in my brain, lol. Don't get me wrong, I think that HoH is a GREAT set of books, but his cash game stuff really doesn't apply well to online games, at least not at the levels we play. His recommendations are a lot about defense and disguising your hands through randomization which may be fine sitting at the same high stakes table in a casino all the time but really has no place facing multitudes of different micro/small stakes opponents (or the same opponents who just don't notice). ^^^yeah, I agree with you on that. Problem is, coming to cardschat for 3 years and reading poker books/strategy guides etc, Ive learnt a lot of concepts, as Im sure we all have, that the average micro stake fish doesnt know anything about, and so these concepts dont work at 2nl/5nl, like they do at higher stakes(Im guessing) and it's really hard to go back to just playing ABC poker at ring, which is new to me anyway. I'm so used to mtts, where, generally, I play tight in the early levels, wait for the fish to get knocked out, and then get into the serious poker where you can employ advanced concepts(i think they are advanced, anyway!) and more often than not they work. Note to self: Dont get fancy at micro-cash, just play premium! Note to self: Dont get fancy at micro-cash, just play premium from EP and gradually open up to ATC from the button with tight players in the blinds! Seriously stealing will improve your overall winrate dramatically. Be especially on the hunt for those loose passives in the blind who will call with everything preflop and then always fold to a cbet unimproved. They are like little goldmines. yeah WV, tried the stealing from late but with mixed results(havent got a HUD so no stats), I pretty much always c-bet but they come along for the ride. I don't steal that much, so it's not like the fish have worked out Im stealing/c-betting with nothing, I hope, anyway, they just like calling when they've invested PF, I guess. I don't steal that much, so it's not like the fish have worked out Im stealing/c-betting with nothing. I've decided rakeback is my EV insurance, it always seems to be making up for whatever Sklansky owes me. 40K hands. ahead of pace. Buy and read a new poker book. Not yet. Watch some training vids and post some hands. Not enough. And obvs. hopefully profit. So far. Play tight and get more money in bankroll. Win some money in MTT that will not be one of the last prizes right after the bubble. This is the cash game thread* , I'll leave Lemly's solid brag as I'm sure that was just a diversion he thinks of as an extra 25 NL roll (or big step closer to 50NL). I haven't been posting in this thread because I took a break from trying to move up in cash after a bad run. Just been messing around or playing other games...might start playing again soon. 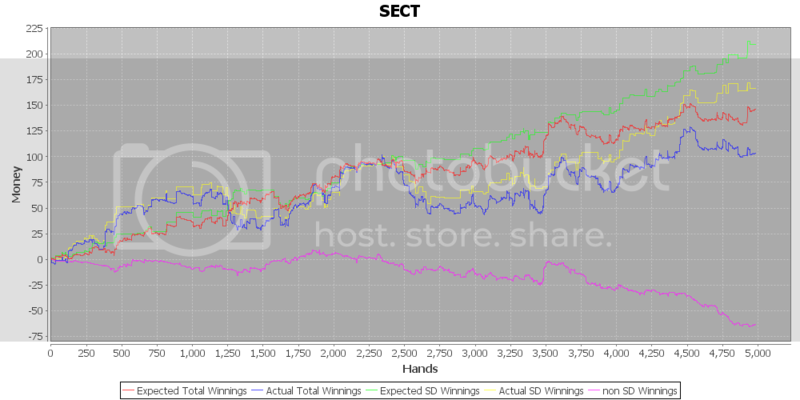 *there's a sng thread, and usually an mtt one, if you'd like to start one. Just to add/point out, using a HUD makes these decisions so much easier. I assume you are playing more than one table. When the table pops up and you see two players in the blinds with high fsb/fbb ratios and/or high fold to flop bets or c-bets, a money symbol should be popping up over your head. 1. Some people float with nothing even out of position with the intention of betting the river when the turn goes check/check. Identify these people and double barrel them with air/very strong hands liberally as they are gold mines. Taking a bet/check/bet or bet/check/call line with marginal hands against these villains is also profitable as they are largely apt to bet the river with air or call the river with a weak pair. 3. Stealing is still very very profitable. 4. Some people have a fixed preflop 3bet size regardless of your raise size. This encourages a smaller preflop raise size. 5. Never ever 4bet bluff unless you have substantial evidence that the villain is 3betting you light. A few 3bets in a row is more likely a rush of cards than light 3betting. There were several occasions where I thought people were 3betting me light but they never ever folded to a 4bet. 6. Do not bluff stations and unknowns. At 25nl, people still call with a surprising amount of garbage. 7. Unlike 10nl, there are a fair amount of squeeze opportunities. In general when squeezing, you should be more concerned with raiser, but at 25nl, I've noticed that the caller (who is generally a fish) calls the squeeze a surprisingly large number of the time so be aware when squeezing OOP. In general, it's better to have a hand with some equity when squeezing unless you are very confident you are going to get folds. 8. Unlike 10nl, there are some semi competent regs at 25nl. Therefore you must be a little more selective in targeting fish to extract money from. At 10nl, play was bad enough across the board that I rarely avoided anyone but at 25nl, I found myself not particularly wanting to be in pots OOP against certain villains. Been doing OK at the .25/.50 7 Card Stud tables, but I tore it up in 3 sessions moving up to .50/1. Seems like a lot of short stacks and scared money. My bankroll is still under $100, so I am not confident enough to play only at .50/1, as I think variance could still affect me greatly. Just been playing solid starting hands and rolling with the pot odds. wtf 100 bucks to play 100? I'm not really sure what a good bankroll is for 7 Card Stud. Judging by the pots I've won at .50/1, my bankroll would take a hit if I went on a losing streak. If anyone has any suggestions on a good bankroll size, let me know. In .50/1 FL, the BB is $1. 300 BBs is considered standard for FL Holdem. With an extra street of BB action in Stud, I would think it should be more like 400 BBs. Nice. I especially like the advice on not 4bet bluffing, and the case for their 3bets more than likely being a rush of decent cards. The initial ante is only .10, and the Bring-in bet (basically the lone blind bet) is .25, with .50 bets to 5th street. After 5th, the bets are raised to 1 dollar. There are some execptions, but that is the general rule. If you want to compare it to FL Holdem, I would compare it more to .25/.50. So, I would guesstimate that about $150-$200 would be acceptable according to your calculations. Correct? The initial ante is only .10, and the Bring-in bet (basically the lone blind bet) is .25, with .50 bets to 5th street. After 5th, the bets are raised to 1 dollar. There are some exceptions, but that is the general rule. If you want to compare it to FL Holdem, I would compare it more to .25/.50. So, I would guesstimate that about $150-$200 would be acceptable according to your calculations. Correct? Disregard what I previously said because the blind and betting structure for Stud was more different as compared to FL Holdem than I had previously thought. That said, having antes makes you need even more because the swings will be larger. A quick online search shows a consensus minimum of around 300BB even at the micros for FL Stud variants (or $300 at .50/1 Stud). I'm sure you can beat .50/1 Stud but there is a fairly wide consensus that the downswings can be brutal even for people who handily beat the game. In FLHE, I went through a very rough stretch despite being a 2BB/100 winner over a large sample so I have some idea of what brutal stretches limit games can bring.